Many people are surprised to learn that Electric Unicycles have been around since 2013, but until quite recently they were expensive, slow, with limited range. For illustration, the original Solowheel was priced at $2,000, had a maximum speed of 10mph, & only 6 miles range. Today there are Electric Unicycles priced at under $1,000 that are 5x more capable in terms of performance & range. At the time of this writing, there are four main manufactures of Electric Unicycles. Solowheel/Solowheel: in the US, the V5F & V8 Electric Unicycles are known as the Solowheel Gide 2 & Glide 3. The Glide3/V8 has been one of the most successful sellers in 2017, for the reasons that it offers excellent performance in a beautifully designed body & at a price point which is not too prohibitive. King Song: established reputation for finding the balance between construction quality, performance & safety. At the hardware level, the King Song Electric Unicycle range have similar specifications as their main competitor, Gotway, but with overall better construction quality, reliability & safety. Gotway: the most dynamic & innovative of the manufacturers, releasing on average three-four new models a year. Their key strength is their ability to push the boundaries of what’s technically possible today. Their Wheel line has a full complement of Wheel sizes, ranging from a tiny 10″ MTen3 with a 3″ wide tire, to the ‘Monster’, which is fitted with a gargantuan 22″ tire. Where the company is to a degree let down, is in the quality of the construction, primarily on areas like the body, handles, pedals, etc. On certain models like the ACM, MSuper, Monster, if the Wheel takes a hard blow, the shell body can become separated & be damaged quite easily. Ninebot/Segway: on April 1st, 2015, the Chinese company Ninebot acquired Segway, since then they have introduced the S1. This Wheel doesn’t really stand out in any particular area. It is neither powerful, nor lightweight, it lacks padding on the sides, no night-time running lights, & has no retractable handle. The above brand Comparison to try to help the prospective buyer understand the different strengths/weaknesses of the available manufacturers. 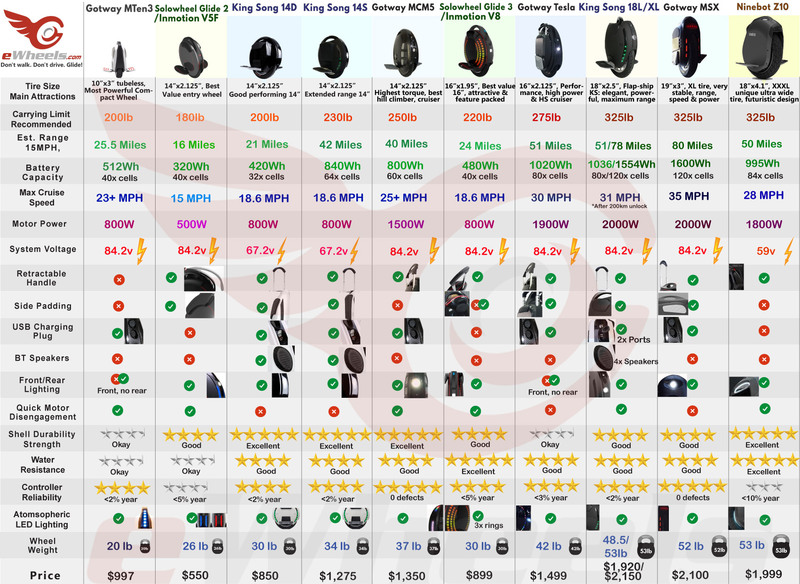 If the key areas are collected into a weighted-score, especially those that Customers are most interested in—like performance, range, value & reliability—then at this point time, King Song, along with the Solowheel Glide 3 have the clear advantage. These Wheels may not be the absolute fastest, nor do they have an exotic micro 10″ MTen3, or at the other end of the spectrum the 22″ Monster, as Gotway have, but across the 14″/16″/18″ Wheel class, for general dependability combined with excellent performance, features & value for money, most first-time buyers who have done their research then either the Solowheel Glide 3, King Song 16S/14S/14D are the preferred choices. While for the most part the hardware is mature & reliable, the same cannot be said when it comes to ‘official’ Apps. Except for Segway/Ninebot—the new Solowheel App looks pretty good, but is still in beta—all Manufacturers fall far short of what a modern App ought to be. Fortunately for Electric Unicycle Owners, there are some 3rd party Apps, like WheelLog & WheelInfo84v (for Android) & DarknessBot (for IOS), that make the reliance on these Apps practically unnecessary. These have near universal connectivity for all the major brands, presenting a clean & informative layout. Class of Wheel: there’s a direct association between a Wheel’s size & the role it’s designed for. A 12″ IPS a130 might be suitable on a smooth paved surface, but try using off-road & the limited pedal clearance & small Wheel diameter will not cope very well. At the other end of the spectrum, a King Song 18S can take on nearly any terrain, yet it’s not something you would lightly throw into a backpack. Generally, the larger the Wheel size, the more capable it is at handling surface irregularities (bumps, potholes, curbs, etc), the more power it has, there is also more available space to pack larger battery packs inside of the shell. The one exception to this general rule, is the diminutive Gotway MTen3, which packs a 800W motor & a considerable 512Wh battery in a tiny 10″ Motor. Battery Options: many Electric Unicycle models have several choices of battery sizes to choose from. Based on our sales data, buyers normally opt for the highest capacity version available, since the benefits of having a powerful motor are only actualized if there is a sufficiently large battery pack to power it. The few models where we offer two different battery pack options, the difference is not in the number of battery cells in the pack, but the energy density of the make/model of a particular battery cell type. Motor Power Rating: how much sustained power the motor is designed for. In the early days of eWheels, Electric Unicycles typically had a 350-500W motor, which was fine for 10-12 MPH cruising speed on level ground, but lacked the oomph need to power a heavy Rider up a hill or sustain >18mph cruising speed. Especially in the past year, motors have steadily increased in power out, where nearly all decent Wheels have at least a 800W motor. Max Cruising Speed: since the beginning, max speed has always been somewhat of a contentious & nebulous topic. In the case of Gotway in particular, they advertise the max speed at which the motor will cut-out; to protect your skin, you clearly want to add significant buffer between you & this figure. Other manufacturers have an electronically max speed that prevents from the operator from inadvertently exceeding the design limits. Recommended Cruising Speed: this is effectively a continuation of the above topic. On a King Song, or Glide 3, Electric Unicycle, one can ride slightly below the maximum speed, knowing there’s a plenty of margin to the capability of the machine. On the other-hand with a Gotway, the Rider really ought not to disable the tilt-back beyond 48kph. Max Rider Weight: if you are above 200lb & are trying to size up an appropriately powered Wheel for your needs, it should be emphasized there’s often a divide between what a manufacturer quotes as being the ‘max weight’, & the true abilities of a specific model. Let’s take the King Song 14D as a case in point: while this Wheel is equipped with a decent 800W motor, a comparatively thick 14mm axle (the previous version, at 12mm, was susceptible to axle metal fatigue), the battery pack is composed of only 32 cells. This means that while it might be capable of supporting the max 240lb load at a sedate cruising speed, if the Rider is doing some hard-acceleration, or tries to maintain the max cruising speed while approaching a hill, the battery pack will probably not be able to handle the abrupt new demands, which may result in a brown-out/cut-out. If you’re around 200lb, then a more appropriate choice would the 14S or 16S with double the battery capacity/power to better support you. Recommended Rider Weight: this is eWheels recommendation, taking into consideration the feedback accumulated from thousands of our Customers, & also from our own internal testing. In nearly all circumstances, it’s better to go with a Wheel that exceeds your immediate requirements. Wheel Weight: ‘carrying weight’ of the Wheel. For the MTen3, KS14S, & MSuper 3 which have the two battery options, they have the same number of cells, so the Wheel weight is identical for either option. The KS18S is different: the 840Wh has 64 cells, while the 1680Wh has 128 cells. The difference in weight is 7lb between the two battery options—the 50lb spec, is for the larger 1680Wh variant. Integrated Handle: this feature makes the Wheel’s weight almost irrelevant, as you’ll seldom find yourself having to carry the Wheel if you can simply extend the handle to shuttle it a long (while powered on). The beauty of the system, is that the self-balancing mechanism supports the load of the Wheel, so that the merest pressure to handle effects its movement. In the 14″ power class & beyond, the only Wheel to not sport an integrated handle is the KS18S, but is available as a bolt-on extra. Integrated Bluetooth Speakers: a signature feature on all the King Song Electric Unicycles. All models are fitted with either 2x 5W, or 4x 5W speakers which can produce a decent reproduction of sound. USB Charging: found on all the Gotway & King Song Wheels, except the KS16S. Handy in a pinch when you need to charge your smartphone, or power other electronics like an Action-camera. Front/Rear Lighting: the King Song Wheels also have an edge with the front/rear lighting of the Wheel. Not only is the headlight substantially brighter on the 14D/S, 16S, & 18S then the Gotways, but they also have bidirectional mode (doesn’t matter if which way round they are ridden, the headlight changes in the direction in which you use it)—the rear light is also much brighter on the King Song range. Another unique property of the King Songs, is the light senor located at the top of the Wheel; this automatically turns on the lights when the ambient light diminishes. Color LED Effects: the side atmospheric lighting might be of questionable value to some buyers, but it unquestionable makes a even stronger impression of wow & amazement to bystanders. The Solowheel Glide 3 is the absolute star in this category, it has 3x the number of LED elements in 3 concentric rings, as opposed to 1 in the King Song Wheels. Pedal Height: measured from the outer edge to the ground, this is a quality with how well a Wheel is able to sharply turn without scrapping against the ground. Another factor is the geometry/shape of the pedal, those with a non-contoured rectangular shaped pedal will encounter a higher frequency of scrapings on tight-turns. The Solowheel Glide 3 is probably the winner here, not only does the outer edge of the pedal have a height of 5.3″ but the oval shape means it’s practically impossible to have the edge of the pedal scrape against the ground during a turning manoeuvre. Durability & Build Quality: based on the historical reliability defect rate data & assessment of the build quality of the Wheel. 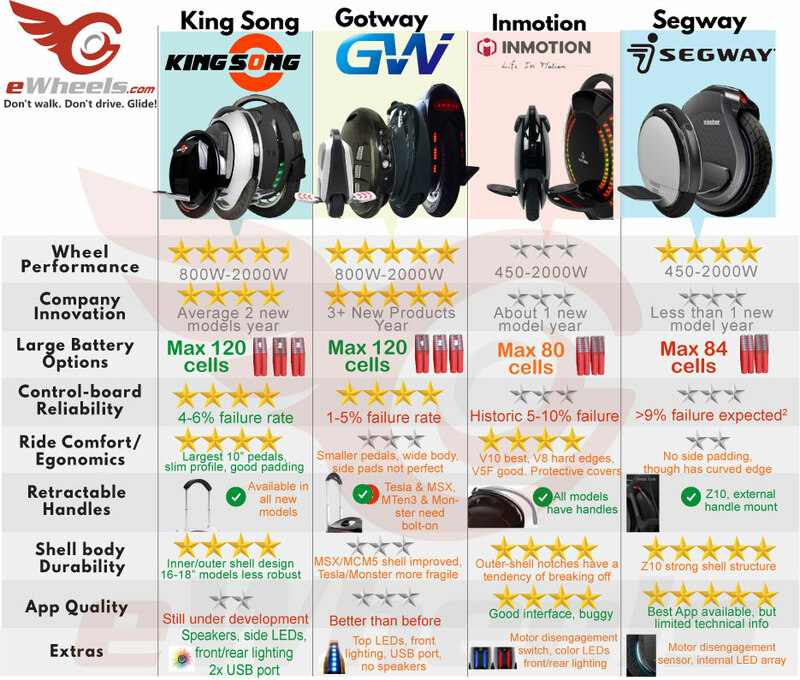 As represented in the above section, Gotway have some lengths to go to bring their Wheels up to the same level of quality of some of the other brands, specifically their main rival King Song & Inmotion/Solowheel. Water-Resistance: a modern Electric Unicycle will have it’s control-board protected with a thin epoxy layer to give it some resiliency against droplets of water that may find it’s way into the vulnerable electronics area, there is no Electric Unicycle which is ‘water-proof’. The general recommendation is that you may use the Wheel in light rain or damp, but please avoid deep puddles & harsh weather. Do NOT leave you Wheel exposed to the elements outside. I’m looking for a Wheel to commute with, I weigh 170lb, my daily distance is 15 miles, which model would be best for my needs? Choosing an Electric Unicycle depends on a number of factors, such as the Rider’s weight, how far/fast you intend to ride, your budget, styling preference, along with what features you would like to have in it. If you are under 200lb, or slightly over this, then both the King Song 14D or Solowheel Glide 3 are excellent first-Wheel choices. The Glide 3 has an edge on rough surfaces, small pot-holes thanks to the larger diameter 16″ Wheel. Both these Electric Unicycle provide 45% more power than the Inmotion V5F (now rebranded as the Solowheel Glide 2), are 5mph faster cruising speed than other entry level Wheels like the V5F, Ninebot S1+, but perhaps most importantly, unlike the Gotway Electric Unicycles, they are designed to endure the rigors of everyday life. Priced at under $1000, these offer excellent value for money in the sub-$1,000 price category. What other considerations should I be looking at beyond the specifications? Facts like the Wheel diameter, battery size, motor power will provide an indicator about how the Wheel will be like to ride, but it’s not the full story, other important characteristics that are not captured in a specification table are. Ergonomics: how comfortable is it to ride? When either starting out for the first time, or trying out a new Wheel, there is usually a transition phase for getting familiar & comfortable with a new Electric Unicycle. The difference between an ergonomic Wheel, & one that is not, is that you can continue ride for a longer duration with less of foot/leg soreness & cramping. Response Mode: this is how the Wheel responds to your lean input (also referred to the ‘hardness’ settings). Some older are what many consider to be ‘very soft’, while the firmware on the current Glide 3, King Song & Gotway models are firm & ultra-responsive. From within the King Song & Gotway Apps, you can define the response mode on-the-fly, in software. The general consensus among experienced Riders, is that they prefer the harder more responsive mode. Pedal Height: especially on small diameter Electric Unicycles & those with rectangular shaped pedals (IPS a130, Segway S1), because the pedal are relatively close to the ground, when you make sharp turns, the leading edge of the pedal has a tendency to scrape against the ground. In most circumstances, it’s only an annoyance, but could catch you off-guard if you’ve never experienced it before. Additional Features: all of the King Song Wheels are fitted with Bluetooth speakers & front/rear lighting for riding at night. Retractable handles are now fairly universal on all the latest model Wheels—some notable examples of Electric Unicycles without handles are the Segway S1, Ninebot E+, Gotway ACM/Monster & King Song 18S. We offer bolt-on handle options for both the KS18S & the Gotways, what this addition looses in the aesthetics, is mostly made up for in practicality & convenience. Post-sales Servicing & Support: even with the best designed eWheel, chances are that at some point it will need a repair or service. eWheels.com is not just the largest seller of Electric Unicycles, & Electric kick-scooters, in North America, we are also a full-service company that provides support, servicing & spare parts after your purchase. Battery pack size & Range: measurement of the battery’s energy content is the Watt-Hour (Wh)—some sellers quoted in Ah, but this doesn’t provide enough information by itself, you also need the battery’s voltage, then the two figures are multiplied together to yield the Wh value. As a general rule, the range figures ought to be 20Wh/mile, assuming a 170-200lb rider, cruising at 17mph on level ground, with a properly inflated tire. Motor power: a suitable Electric Unicycle motor is 800W & above. Try to avoid Electric Unicycles with 400-500W motors, they just don’t have the necessary power to support a Western adult rider. Is the control-board good enough? certain Electric Unicycles have been afflicted by a high rate of failures; anything over 3% a year, is considered to be unacceptably high. The Gotway control-boards have a chequered history of reliability. The most reliable control-boards in the industry, right now, are the King Songs, which are fitted with components to withstand many times what one would normally experience while riding. Direct relationship between an Electric Unicycle’s Range & Power. When the Wheel has more batteries, they are added in parallel sets. For instance, a mid-range Wheel, like the KS14D has 2x parallel packs (one on each side of the Wheel) consisting of 16 cells each, for a total of 32 cells, each of these cells is capable of providing a finite amount of power. In the next Wheel up, the 14S, has a total of 64 cells, 32 cells per side. From the perspective of the battery pack, this means that the 14S’s battery can provide double the sustained power of the 14D. The new Solowheel models are 84v, there is evidence that this higher voltage gives you a slight edge in safety margin & Wheel responsiveness too. In theory, More Power = More Safety: if an Electric Unicycle is fitted with a 1200W motor, but you choose to limit the speed to 20MPH, this gives you a significant margin of safety to deal with most contingencies. Quality/type of batteries: having a Wheel with batteries from a recognized supplier like Sony, Panasonic, Samsung or LG is not enough to ensure a minimal level of performance from the Wheel; it’s the particular model of cell that matters most. A good battery cells should support at least 10 Amps of sustained power when configured in a pack size of 32 cells. Electric Unicycle brands matter: there are only a handful of established & mature Electric Unicycle manufacturers. At the time of this writing, there are really only three companies actively developing Electric Unicycles, Solowheel/Inmotio, Gotway & King Song. While the Gotway Wheels are fast, exciting, & exotic, their reliability & safety leaves much to be desired. King Song & the Solowheel Glide 3, on the other hand, have taken the more conservative & sober approach, by electronically limiting the maximum speed to provide a higher margin of safety for their Wheels.